What Is VCD and DVD? How to Convert VCD to DVD Directly? VCD, short for Video Compact Disc, is also a compact disk format based on CD-ROM. It is used to store MPEG-1 video data which usually has an ordinary CD size of 120 mm diameter and it includes interactive capabilities. In most cases, VCD has the same resolution as VHS which is much lower than DVD. Generally speaking, compared to VCD, DVD has the higher resolution and better video playback quality. DVD refers to Digital Video Disc which is much advanced in optical disc technology and higher movie compression (MPEG-2). In comparison between VCD and DVD, it is easy to find that 1. DVD has larger data capacity than VCD; 2, DVD has better video quality than VCD; 3. DVD player could play any VCDs while VCD player couldn’t be applicable with DVD. Therefore, many users may have the need to convert VCD to DVD in order to play them on any DVD players with ease. Besides, users are able to customize the old VCDs in the form of DVDs. Under the circumstances, how to convert VCD to DVD quickly? What are the best methods to burn the old VCD to DVD? Next I will show you several methods. Maybe the most direct and convenient way to convert VCD to DVD is to use the additional VCD-DVD burning software. There are a large number of converting programs for you to choose. Here I will introduce two programs for your reference. ImTOO DVD Creator, as one of the programs which could be used to convert VCD to DVD, is quite easy to be operated. Its high speed conversion and simple interface is highly recommended by many users. The conversion process is quite simple. You just need to import your VCD disc on your computer’s disc drive and open the program. Then you need to click the DVD burning button after adding the .dat file on the VCD disc. When it is done, you could obtain a new DVD file on your computer. Finally, you need to import an empty DVD disc to store the burned VCD content. Just following several steps, you can easily convert VCD to DVD. Just as you know, the file format in VCD disc is MPEG-1 and it is usually showed as .dat format file. As one of the convenient MPEG to DVD Creators, Xillisoft is a good choice. It can help you to burn DVD from MPEG and DAT files which means it can convert VCD to DVD easily. The converting steps are similar to the former program ImTOO DVD Creator. Besides, it also allows you to edit the videos and customize the video clip. But the editing features are more limited. If you are searching for a simple VCD to DVD converter, you can take a try. Besides the above programs, I will push another converting tool to you. That is Leawo DVD Creator. As a professional DVD creator, Leawo DVD Creator could help users to convert more than 180 video formats like AVI, MKV, MP4, WMV, Xvid, MOV, FLV, and more to DVD-5, DVD-9 disc, folder and/or ISO image without quality loss. Meanwhile, the software could allow users to trim video length, crop video size, adjust display effect and so on. Besides, the software offers you present multiple menu templates and custom design. Before using this powerful program, in order to burn VCD to DVD successfully, you have one more easy thing to do. That is to extract the content from the VCD disc and store it on your computer. Actually, this step is quite easy. Just as mentioned above, first you need to import the VCD disc to the disc drive and a folder will be opened automatically. Usually, you will find a folder named MPEGAV. You just copy the whole folder to your computer. And the files in the MPEGAV folder are all .dat format. You must change the extension dat to mpg. Then the next step is to burn those MPEG files to DVD. Now I will show you the detailed burning steps. Step 1. 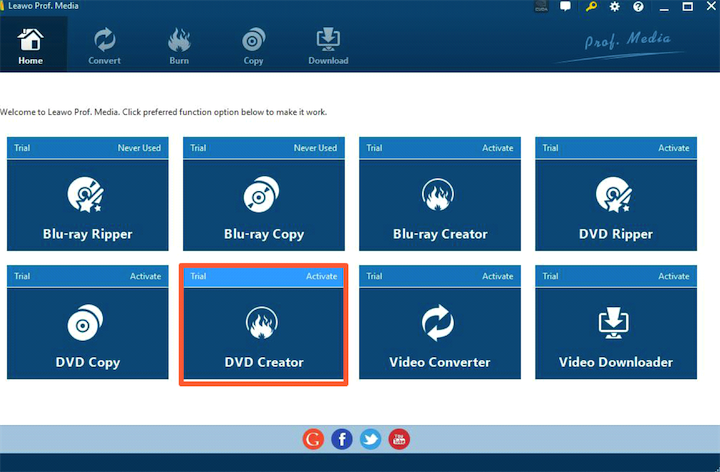 Download Leawo DVD Creator. Step 2. 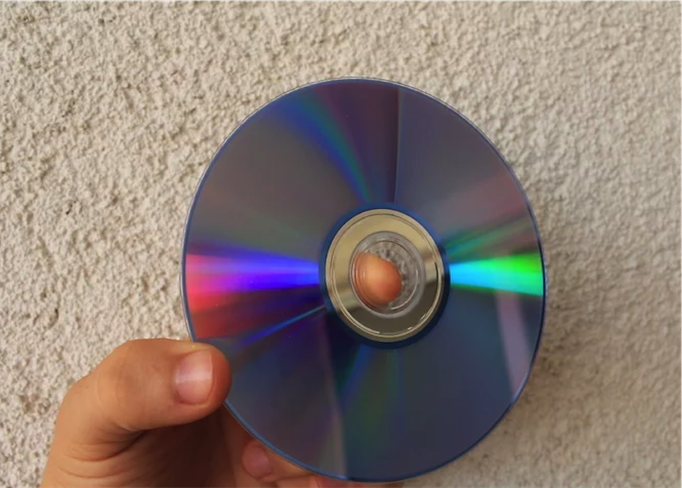 Insert a blank DVD to a PC’s CD drive. Step 3. Import MPEG files to the software by clicking Add Video on the main menu. Or you can just drag the files directly to the program. By the way, after loading the files, you can set the output DVD disc type (DVD-5 or DVD-9), quality and aspect ratio (16:9 or 4:3) at the bottom. Step 4. After importing the MPEG file, you can also set the disc menu. Usually it contains Standard, Business, Education, Childhood, Holiday, etc. And you can DIY your own disc menu with your images and audios. Step 5. After setting the templates, you can just click the green icon Burn to start burning process. When you click Burn, you will see burning settings panel on which you need to figure out Burn to, Disc Label, and Save to options. Step 6. 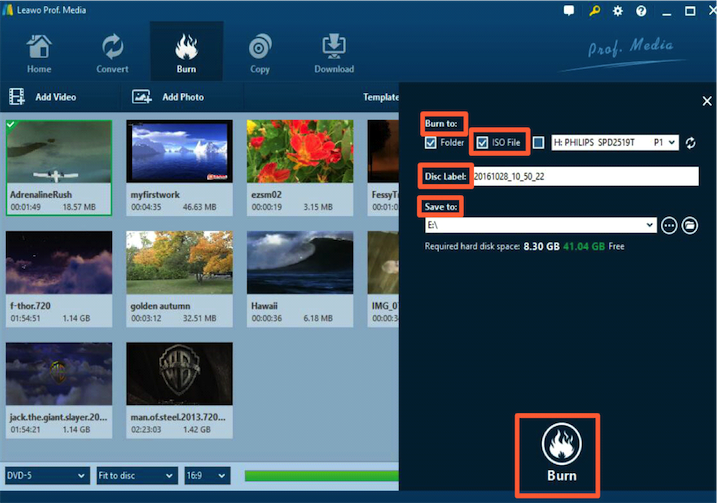 Finally, just click Burn icon below to start burning VCD to DVD. Please be patient, the burning process will last for several minutes. When it is done, you have converted VCD to DVD successfully. Therefore, according to the comparison among the several converting programs, Leawo DVD Creator is more powerful in its converting functions and customized editing features. It is more professional than other software. You can have a try.